As I was looking for a topic to write about for this week’s blog post, I scoured the blog sites looking for a topic, hoping to find something about the “sexiest” new thing released, but without any luck, I decided to call it a day and meet up with some friends for a drink. As I sat there, at our favorite bar, listening to one of my friends tell a story about how they painted a picture that made you feel like you were there, It got me thinking, what’s the difference between telling a story and being a storyteller? As a marketer, we’re always told that it’s about making a connection with our (potential) customers through a story. But the question is, how do you do this? How do you get someone to not just hear what you’re saying, but also listen? What’s a story without emotion? Facts? If you want to make a connection with your customers or potential clients, you need to evoke emotion. Finding an interest that will make a connection between your customers and your brand is the best way to gain a loyal following; That connection can be made from finding something that reminds them of themselves or inspires them to do an action. Check out Bluestar Donuts as they use their words and imagery to fuel your appetite and your love for your mom. Is a user going to remember your post later in the day? Was there something about the post that lingered? Find something that sets you apart from your competitors, whether it be a unique image or the copy that goes along with it. Lululemon does a great job creating memorable posts by sharing stories of their customer with their products in action to take it to the next level. Keep your voice consistent. Evoking emotion and being memorable doesn’t mean anything if you don’t have a set identity. Finding your voice can be a struggle, but once you learn to showcase your brand’s values, the other two will fall into place. 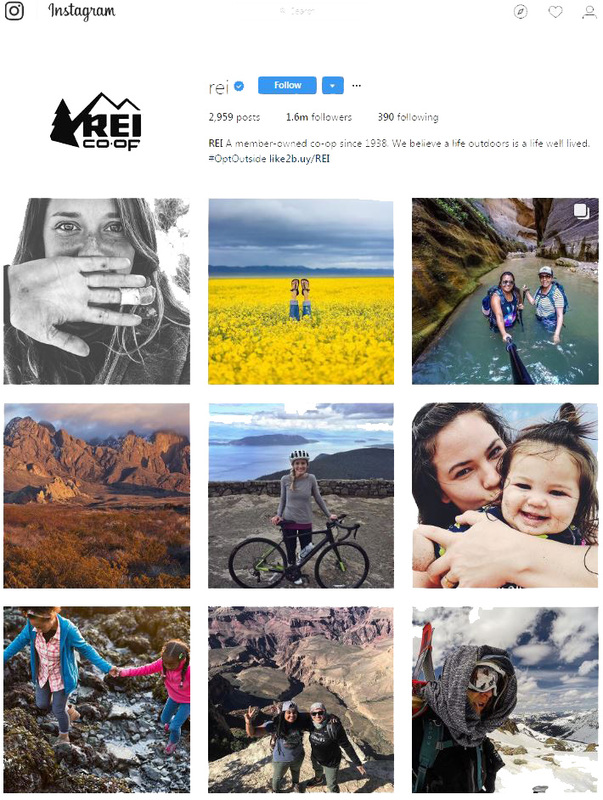 REI shares imagery that not only clearly shows they are an outdoor brand but encourages adventure and pushing the limit. Click here to see REI’s successful storytelling. Users can see right through the BS, be upfront about what your brand stands for and what your brand’s story is. Trying to be something you’re not will only reflect poorly on your brand and will come off as being inconsistent. A photo is worth a thousand words, right? Imagine what 10 photos can do? Adding photos to a photo album is not only a great way to group similar images, but every time you add an image to that album, Facebook will re-share the whole album helping promote your story. Who doesn’t love a great video? Show users how great your brand or product is by letting others share their story through a video. Setting up your Facebook ads to show up in a narrative sequence. For example, having an introduction to the brand, an article about the brand, and ending it with a CTA. Check out this study done on sequenced messaging ads. We all think it’s about the imagery, but we forget the power that our words hold. AirBnB does a great job at sharing a short story with every Instagram post. Twitter moments are a great way to create a collection of tweets that help form a story, this can be centered around a product launch or maybe an anniversary. There are countless ways to tell your story on social media, I hope I’ve inspired you to share your brand’s story. Contact us if you need help finding your voice or the right channel to tell your story, we look forward to hearing from you!